One of the dreams I had when starting this forum was to revive interest in the art of ladies' tailoring. I thought that women were interested in clothes, in fashion, and in sewing. To my surprise - my great surprise - I seem to have found myself proven wrong. In fact, there are probably more men posting here regularly than women. There has been no influx of women interested in the traditional art of tailoring at all. Perhaps the male is the peacock of the species after all? Tailors who have been in business for many years all tell me of how in decades gone by, women (and men too) were willing to pay for the best that money could buy. Cost mattered little. Style and elegance meant everything. Today, it has all changed. The expectation is that clothes be cheap. Cheap, like the Chinese made factory stuff filling the stores. Cheap like the Thai tailoring offering dirt cheap "tailor made" suits they saw when on holidays there. I do admit things have changed. Today, a woman thinks of buying a new laptop, an iPad, a new car, shares, an investment property - and so do her girlfriends. They don't wear fancy clothes, they just wear Chinese made jeans and t-shirt, so why bother when there is no competition? Yet another part of me is puzzled. Women do spend big at the hairdresser, on manicures/pedicures, make up, handbags - and shoes, countless pairs of $25 Payless shoes, condemned for consignment to the rubbish bin after a couple of wearings. I somehow thought that women were meant to be frightfully exacting and demanding of perfection in their clothes. Was I so wrong? Far from it, women seem to be happy to put up with the inevitable creases and rumples that come with ready-made clothes. The relentless drive for perfection from women is, however, not yet dead in my experience. No, far from it in fact. The tiger is merely sleeping. For the moment a woman comes to the try on, the fitting of a bespoke coat, all of that tolerance for ill fitting ready-mades suddenly goes out the window. Every little crease is ruthlessly scrutinised once more. And this is why tailors traditionally have to charge women more than men. It is like hairdressing where even a simple trim of a bobby haircut is charged at a higher rate. It means that more time and care is required with female clients. Add to that the fact women are harder to fit due to the range and complexity of different combinations of curves, and it means that it really does take more time and skill. What a shame that many tailors capable of making for women say that they "don't do" ladies' tailoring any more. The reason is they say it's too hard to explain why it costs more than for her partner, not to mention why it costs more than ready-mades - as well as that damned Thai tailor. With that ladies' bespoke tailoring has become a much more rapidly dying art. Dearest Sator, thanks a lot for this great guide, and for putting women's themes on the agenda of C&T. I'm an avid reader and learner. Only wondering why the professionals around do not participate much in those discussions. As for why women have almost completely abandoned the claim to elegant, well fitted clothes, I think there has been a real paradigm change. Women in the 1950s wanted to be ladies, but women in our time want to be professionals- and real smashers at the same time. Guys, that means a lot of stress! No time or money left for something that takes long and lasts long. And why invest in something that's out of fashion next year or that needs remodeling when you've lost 7 kg...... Better take something stretchy. But seriously: I agree. When we begin to SEE the difference of something really fitting, we become addicts. So please hang on training our eyes! Thanks a lot for the guide. Very helpful. I think one reason that nicely fitted clothes are not in demand is that many people don't know what good fit is. I literally had to Google it a couple of years ago. I'm used to shoulder seams sagging somewhere near my biceps. If I obsessed about how poorly my clothes fit I'd never leave the house. Unfortunately, now that I've been taking some sewing and tailoring classes I notice everything. The Sixties was the era of "letting it all hang out," and that applied to clothes as well. 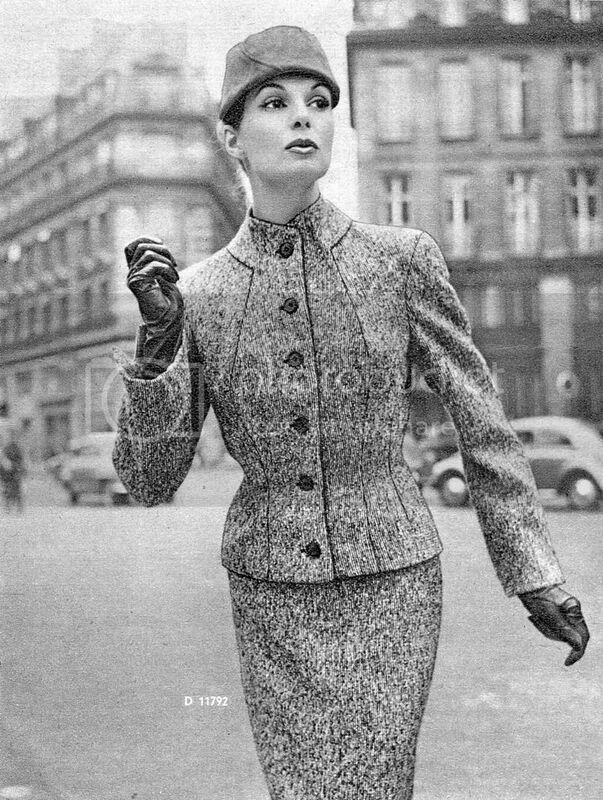 After the tight control and artificial overblown silhouette of the clothes in the Fifties (I hate the "New Look"), it was a necessary change, as well as more appropriate to the turbulent political climate. It also was cheap. Slip on a cheap mirrored tunic from India and you're good to go. The truth is that most people, especially people without the proportions of models, actually look better in semi-fitted clothes. But such garments are expensive to make. I also have a slight prejudice toward tailored garments as somewhat "fussy." I admire the workmanship that goes into couture, but often it's stuff that I'd never want to wear. I also hate having to take clothes to the dry cleaners, and clothes can only be dry cleaned so often before they fall apart. Which means if if you're going to wear tailored clothes, it helps to have a lot of them. I have a variety of additions to add to Sator's orginal post and the two responses. Since I am one of those who has not posted as regularly as I should, I'll break this into small segments and add a few items at a time. In the French haute couture, dressmaking (flou) and tailoring (tailleur) continue to be separate in most couture houses because the way you sew wool--the basic fabric used for tailoring--is quite different from sewing velvet and chiffon, but there are some some similar basics. I'll return to this another day. In the HC (haute couture), "couturier" can be a woman as well as a man; a "couturiere" is a very good dressmaker. In tailoring for women, there are two types: the traditional tailoring used for men and soft tailoring, which is sometimes called "dressmaker" tailoring. The YSL (Yves Saint Laurent) blazer is a good example of the former while the suits and jackets from Balenciaga and Chanel are examples of the latter. Even though both have similarities such shaping the wool and pad stitching, there are differences such as buttonholes, sleeves, and design. The differences in design are pretty straight forward. The most obvious are the notched collar on a tailored jacket and the collarless cardigan on a dressmaker jacket. Other differences include the kimono sleeve and bound buttonholes which Balenciaga frequently used. Chanel used both thread and bound buttonholes as well as a combination (Chanel) buttonhole with thread on the fabric and a faux bound buttonhole on the lining or facing. The Chanel buttonhole is used when the lining or facing is a different color and the stitches of a buttonhole with contrast thread would be unsightly on the inside of the jacket. The faux bound buttonhole covers the stitches so the buttonhole is inconspicuous when the jacket is removed or worn unbuttoned. The panel jacket design with the seam from the shoulder over the bust is called a "princess" seam in the U.S. It is the easiest design to fit--particularly for figures with a full bust. When it was invented by Charles Frederick Worth--the father of HC-- in the mid-1870s, it was used to describe designs which had no seam at the waist. Today, it also describes, a seam that begins at the armscye and continues over or near the bust to the hem or a horizontal seam. The biggest problem when tailoring women's jackets is fitting. Most sewing books provide recipes for fitting specific problems but do include the basic fitting principles or how to identify fitting problems. According to Threads Magazine and Vogue Patterns, their readers want more jacket patterns and information about tailoring. The bigger problem is that fewer women sew today. This could be considered collateral damage from the women's lib movement in America. As late as the early sixties, many states required girls to take basic home economics (and boys to take shop) in middle school. With this introduction, girls continued courses in high school and sometimes in college. It is now illegal to require students to take specific courses based on gender. In today's world, you can easily have 3 generations who don't sew; and, even though many girls who took home ec did not continue sewing, they were introduced to the basics of fabrics, design, quality, and fit. "Nearly everyone has some kind of fitting challenge." Like it or not, when maturity begins to settle in, buldges appear in formerly flat areas and fatty tissues arrange themselves confortably around the body. This causes changes in posture, weight and height . The question is how do we adjust patterns to accommodate the areas where bulges develop or enlarged or How do we fit the mature figure (women). During maturity some of the changes that occur are as follows: Rounded Upper Back, Decrease in height above or below waist line, Rounded shoulders , Lowered bust lines and enlarged or protuding abdomen. For home sewers all the above are fitting problems that require special attention. Reference is made re: mature figure, but what about the young women who has lowered bustlines and enlarged abdomen? How do we fit around the bust and still maintained a tailored look (no sagging around the bust, armhole or neck areas) , before drafting our patterns we must first become familiar with fitting solutions. We ask ourselves what can we do to fit these areas effectively? Pattern for women clothing should be modified to fit around the bust, armhole, neck and the center of the back on the waistline. It's very nice to know about your concern about the technical performance of women in tailoring. I have found several interesting and informative articles on the development of women's clothing. However, we need more tips today. I developed my techniques to build coats male and female from article by Ms. Claire Shaeffer on techniques of Yves Saint Laurent. PRACTICAL INFORMATION applied the sleeves on jackets male and was very good. This discussion feels like a wide-open opportunity for my question this morning. First, I am a lady who admires the bespoke tailoring. Before becoming a full-time, stay-at-home mother, I worked at General Motors and appreciated "classic" clothing. For practicality, you will most often see me in casual attire, but when I go anywhere important, I prefer to dress nicely. Through the years, my husband has bought clothing for me that he prefers, like a classic pleated skirt from Pendleton. I also found a beautiful Burberry wool skirt from England, also beautifully pleated. I have seen how quality lasts and remains beautiful for many years. There are also benefits to quality cloth in fit and wear; the enjoyment of the garment overall. I am also on the look for ways I can purchase quality clothing, as long as I can afford it. (I am also raising six children. My girls are now creating their own garments, and I see this as a great learning tool for recognizing quality in their clothing. So, here's my question. I am looking for an outter wear coat for myself. I love wool. I was looking at Pendleton's website, and see many things imported and of polyester blends. I want something that could go between casual and dressy and that goes to maybe mid-thigh. I am willing to save up before purchasing something like this. Does anyone have any suggestions? I would love to patronize those who care about the quality tailor's art and the craft. And I appreciate the workmanship that goes into well woven cloth. Thank you for the guide. The suits are beautiful. I have always loved finely tailored clothing. Well tailored, quality material, is a very expensive endeavor. I regret to admit that every time I attempt to make a garment, I would have probably done better to become a professional that that made enough money to purchase the clothing I love. I have spent more money and time trying to learn how to make beautiful clothes that seem more elusive to me than ever. And now that I have found your blog, it seems that I am spending more time reading about beautiful clothing lol!. Well, I love your blog!